A slideshow of pictures some of which are below. JBudz wanted to to a whitewater trip, playboats and camping gear. 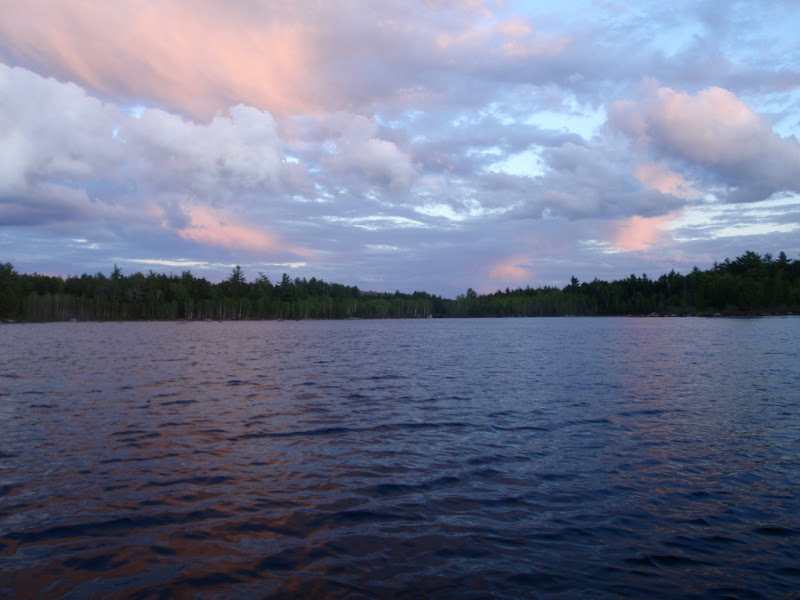 He hoped that, by starting at 3rd Lake, cutting out 5th, 4th and 3rd lakes, the Machias would be good for that, with class I, II, III and even a IV interspersed with a few smaller lakes and quiet water stretches. But many folks warned us that even then there would be a lot of flat, slow moving water with a good possibility of headwinds. 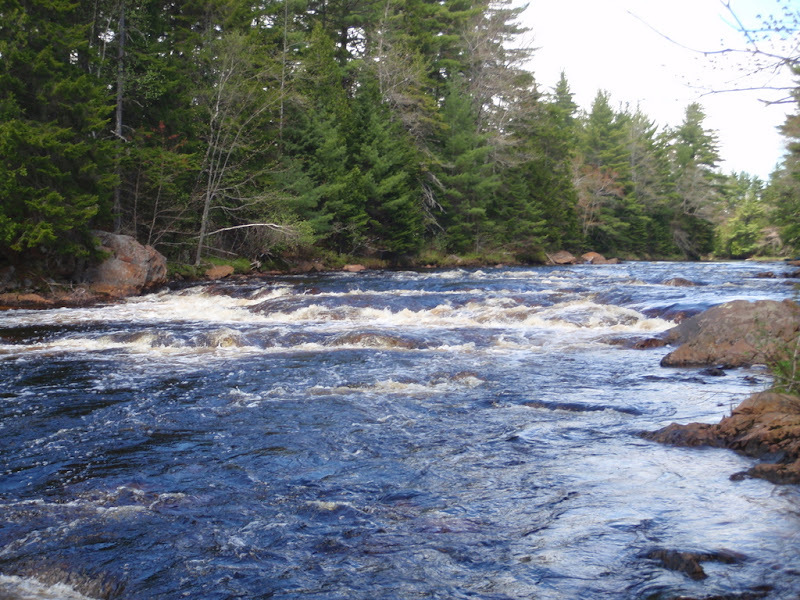 Then iceout came early and the river dropped to where we wondered if we'd even have water in the rapids? So we decided to take the touring boats. Glad we did. Monday I drove up from Massachusetts and met the guys in the town of Machias. We dropped my truck at the Whitneyville landing and headed up to 3rd lake. Above Rt 9 the drive is on logging roads. JBudz I-phone GPS saved us a lot of aggravation as the maps are not up to date or clear. We car camped at 3rd lake outlet enjoying a short squall then a lovely sunset along with the blackflys. Tuesday morning was bright and clear. We loaded the boats and started down a a few miles of quickwater and class I to Long Falls. Even at this level I'd call Long falls a III with a lot of rocks mixed in with the water. We portaged our gear. Jim portaged his boat. Jeff said he'd follow me. He soon realized his error and carried around that particular pitch. I lost my spare paddle but found it in the eddy where I'd left my gear. How's that for good luck! A lesson. My Osprey has a bench seat and I put in thigh straps for this trip. When the boat pinned I had one leg hooked under the seat and the current was pushing me back so that I could not free that leg. Fortunately my head was above water and the current was not so strong so I could pull myself forward, free my leg, and get up on the rocks. Also fortunately the boat did not come loose while I freed myself but was easily lifted out of the pin. There's a lot of ways that could have gone bad but it didn't. I did not use the straps after that and tried to remember that I was not in a playboat. Long falls was followed by a few more miles of class I-II leading into 2nd Lake where we stopped for lunch. The site we stopped at has road access. While off feeding the tree I came upon a stash of potted seedlings, mostly pine and cedar. I sumrise that someone didn't feel like planting them or taking them back and ditched them there in the woods. Since my boat was sadly lacking in potted plants I took a cedar with me naming him Tree. From there it was 8 miles of quick and still water, through 1st lake and down to Karrick Pitch. This is listed as a II-III drop but at the current low level it was a very technical II. We all portaged our gear. Jim portaged his boat while JBudz and I had uneventful runs. Tree seemed to enjoy the rapid as much as he did the rest of our float. 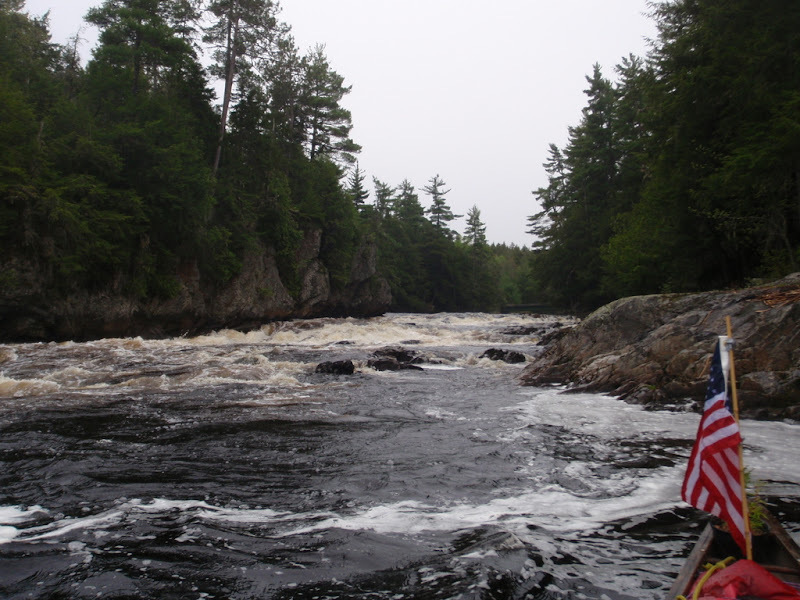 Soon after we stopped at the RV camp the mouth of the West Branch Machias for the night. No RV's were spotted but we did meet a guided fishing party who'd been up on the West Branch. Wednesday morning started out damp. It had sprinkled off and on over night but stopped by the time we were breaking camp. We quickly ran the 4.5 miles of class I - II down to Rt 9 and the Airline rapid class III (?) as the sun came out. We stopped to scout. Jim portaged. Jeff portaged his gear. I ran under the highway thinking I might portage from an eddy below but I never saw anything resembling a III, just a very technical II, so I kept on to the bottom. Tree would have been grinning if he had a face. Jeff ran his empty boat down while I helped Jim with his portage. 4 miles of quickwater and class I brought us to Little Falls listed as a class IV. It was not that at low water but I could not see a way through the rocks at the ledge that probably forms big holes in higher water so we carried around to the campsite at the bottom. This was the first time I ever portaged the Osprey. I didn't get the balance right and that left me sour. I'd said I'd leave Tree if I had to portage but I just couldn't leave the little guy all alone so he came too. 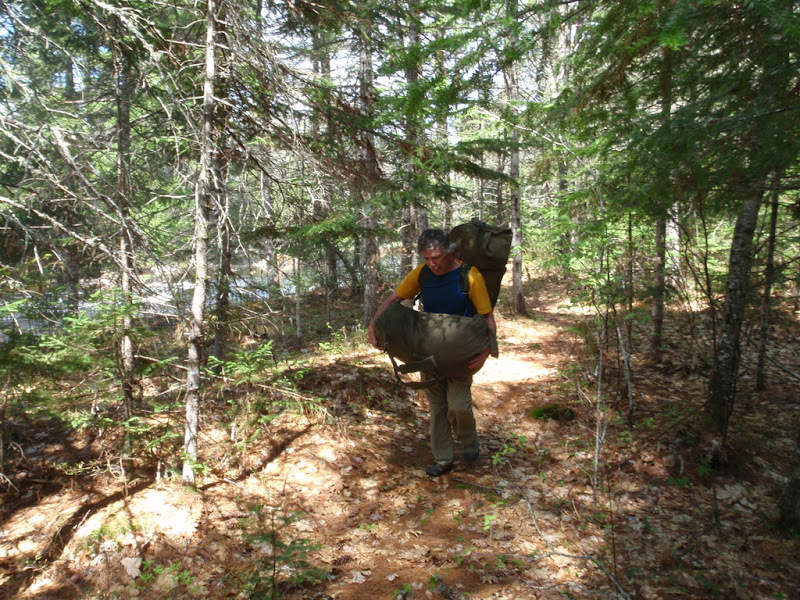 This was the second long portage of the day for Jim. 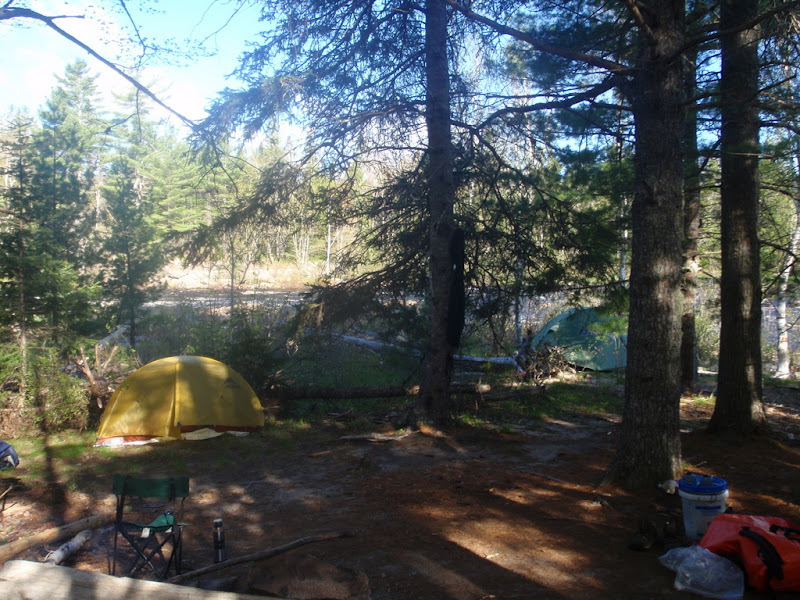 It was only noon but the Little Falls campsite was pretty nice so we decided to hang out dry out and relax. We talked about the fact that we would have a twenty mile day with several portages and lots of flatwater Thursday as a result but everyone seemed OK with that. JBudz made cinnamon rolls in his reflector oven. Mmm. Thursday dawned bright and clear. With a long day ahead we headed out early. 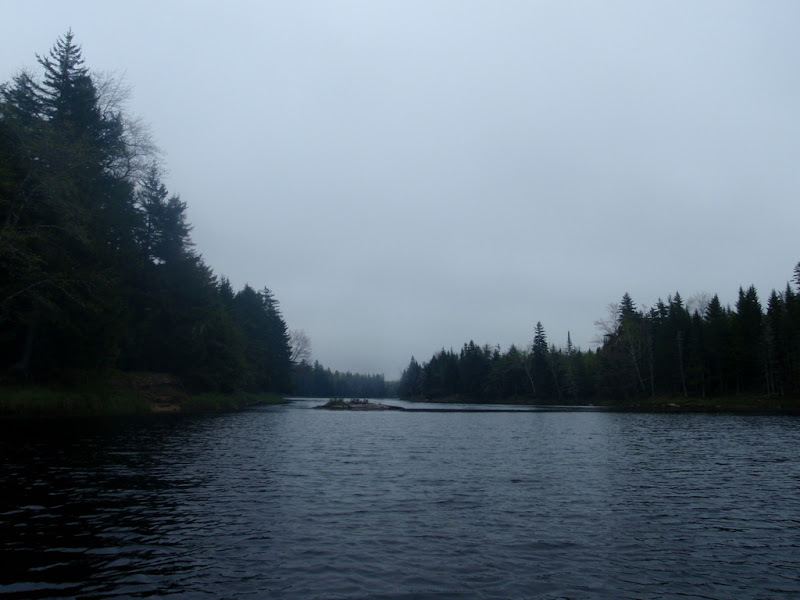 As we paddled the quiet water leading to Wigwam it clouded up. Wigwam was class I-II and we just blew on through much to Tree's delight. Nine miles from our Little Falls camp we came to Upper Holmes class IV per my AMC guidebook. As we portaged that the rain started. It slacked off a bit as we got to Lower Holmes. The left side of the island there was a fluid easy class III with multiple routes. JBudz and I ran that loaded. I could tell Tree was ecstatic by the way his fronds were waving around. Jim took a look and decided to try lining the rock choked but much smaller right side. Half way down that he had to get back in the boat. His Wildfire took a bit of a beating but he got down all right. 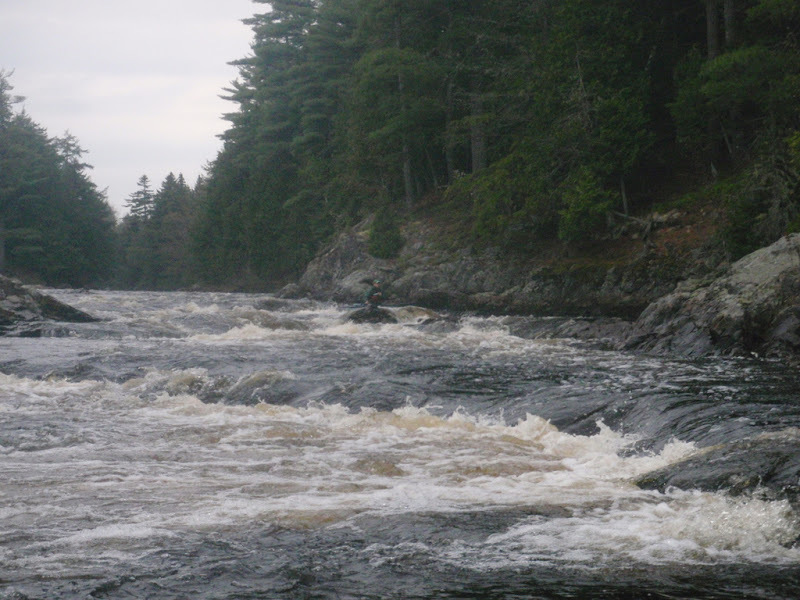 There is 11 miles of flatwater between Lower Holmes and Great Falls where we planned to camp. We stopped for lunch in the chilly rain and I noticed the rock snot for the first time. That's ugly stuff but the fish didn't seem to mind it. None the less we'll have to wash everything that was in the water so that we don't spread the goo. We paddled on, sometimes into a headwind. The rain got lighter then heavier then lighter again. It even stopped for a while once then started again. At least it kept the blackflys down. The day wore on. We were looking for Smith Landing, 2 miles before Great Falls, which has a campsite listed as "poor". If we'd found it I expect we'd have stopped but we never did see it. JBudz' GPS said we were beyond the 20 miles we thought we were going. The rain stopped again. I noticed Jim was lagging. JBudz was off ahead. Finally Jim called to me saying "I'm stopping here." He pulled off and climbed up on the bank to look the spot over. "I'm staying here." he said. "You guys go on and I'll catch you in the morning." Jim was our early riser so I didn't doubt him. I thought I might find JBudz and come back if he wasn't too far ahead. So I took off. Half a mile down was Great Falls, JBudz' boat at the portage. 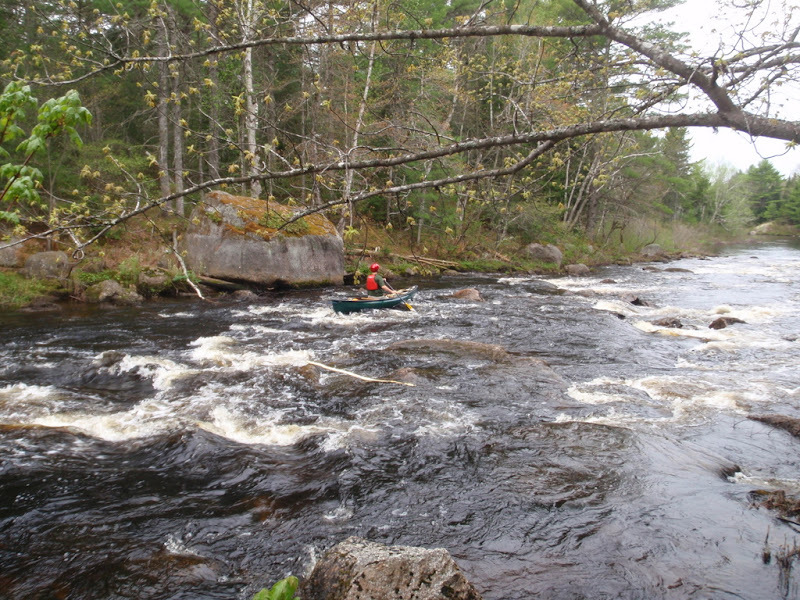 It was the longest portage so far, running in away from the river before you could get much of a look. I met JBudz coming back up the trail. He said we were about halfway. I'd started feeling cold when I got out of my boat. He said he was chilly too. We looked at the rapid from above and noted something, a wave or a hole about a third of the way down with a big eddy to the left. It looked reasonably fluid. I was shivering but I knew a nice rapid would warm me up. I told him I wanted to run it loaded. He did too. See you in the morning Jim. I had a fun run down to the eddy that warmed me up a bit. The eddy was full of rocks right at surface level. Took a few more chunks out of the Ospreys gelcoat. I wish I'd had my camera ready. JBudz boofed the big rock, blew right through the hole we'd seen and kept on going. Showboat! At the bottom, feeling warm and alive, we made camp while Tree stood in my bow basking in the afterglow. It sprinkled a bit as we were were collecting firewood so I put up a tarp. That must have appeased the weather gods because the sun came out soon after. We found enough wood for a good long fire. JBudz made Chocolate chip cookies in his reflector. They came out perfect! But we'd had a long day and were nodding soon after dark. Friday morning dawned cool, bright and windy. 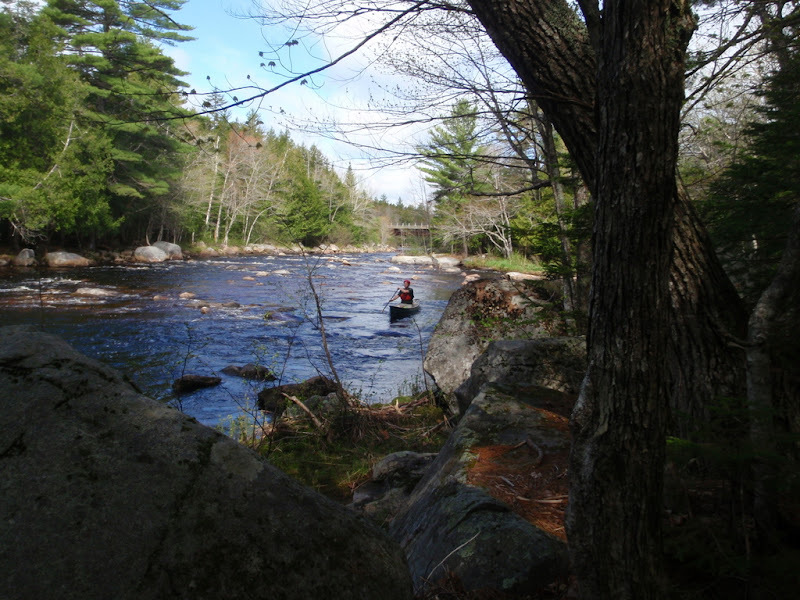 Jim showed up as I finished my breakfast so I helped him carry his gear down the portage. The wind was blowing pretty good but fortunately for us it was at our backs except for a short bit when the river S turned. 6.5 miles of windy quiet water and we were in Whitneyville by noon. I was happy to find my truck unmolested. We loaded three boats up and headed into Machias for a burger and some Gritty's Blackfly Stout. My Osprey took a beating. Knocked a few chunks of gel coat loose as well as making many new scratches. But I've found no serious damage, no soft spots and no dents. That Swift Expedition lay up really is all that I'd say. The Bell Yellowstone Solos seemed to match the Osprey's performance pretty well. I'm more and more impressed with those as I see them used by capable paddlers. Thursday night my wife got a call from an officer at the Maine State Police. A fisherman had noticed that my truck was there at the Whitneyville landing for a few days and called them. When she told him we were camping on the river he told her no problem and appologised for disturbing her. Nice report, Tommy! 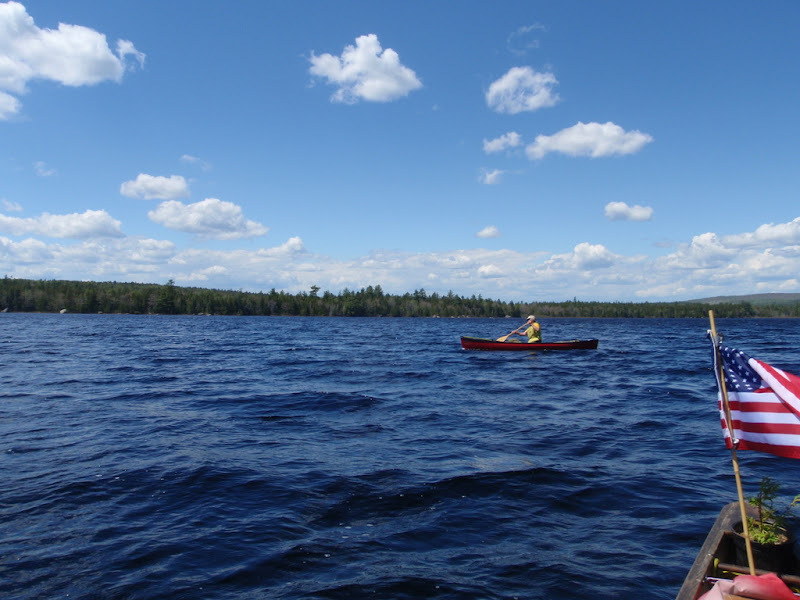 Did you consider taking tripping canoes and poles? I'm really glad that we took the tripping boats. Tandems and poles were considered but the wind and flatwater would have been pretty miserable in a large boat. 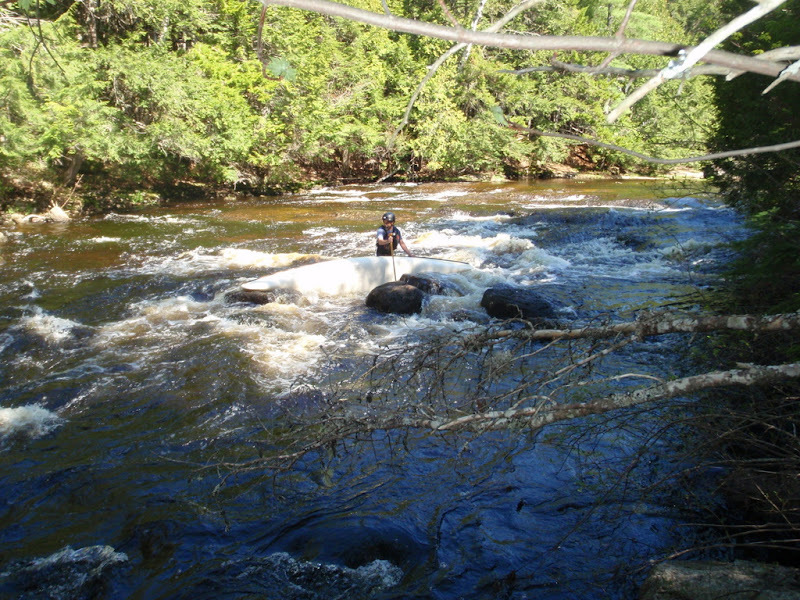 The flatwater sections were quite deep so a pole wouldn't help there, and the rapids still had a little too much water in them for snubbing. I soloed a 17'6" Swift Yukon on the St John last year and did OK. It was just as fast or faster than people in solos and almost as fast as the people paddling tandem. The only time it was a real pain was approaching and on Baker Lake, when there was a lot of wind. Soloed a Dumoine on the St John a couple of years ago. Miserable headwind and snow. The other twelve were in tandems. At least we all camped together. This was not by choice. Our fourteenth paddler disapppeared back to Ft Kent allegedly to get beer before the trip. I have little or no use for snubbing. I use a pole to go up river. This trip was all down. The section of the Machias that we did seems to go from deep and slow, roughly 1 kph, to moderately steep and fast without a lot of quickwater in between. Having boats that could handle the rapids OK AND be reasonably efficient on the flats in the wind went a long way towards making the trip enjoyable for me. In higher water I suspect we might get beyond the whitewater capabilities of those boats. At that point I'd have to decide between a tandem ie my MR Explorer or a big solo whitewater boat ie my Dagger Encore. Right now I'm thinking the Encore would be preferable but in either case I'd leave more time for the flats.